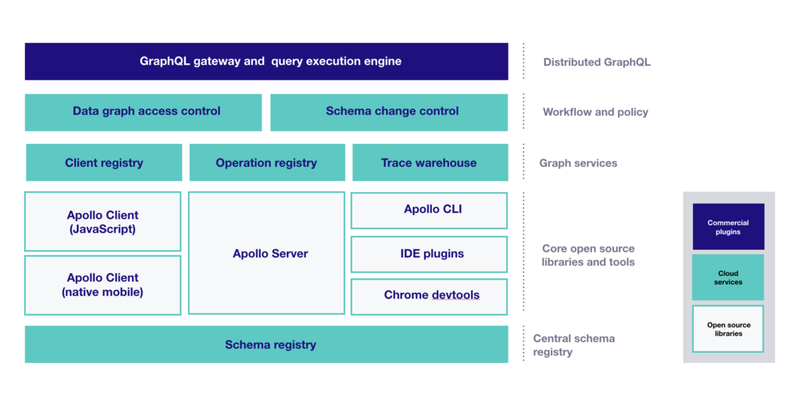 Apollo is an implementation of GraphQL designed for the needs of product engineering teams building modern, data-driven applications. It encourages an agile, incremental approach and takes special care to avoid requiring any changes to existing APIs and services. Apollo puts particular emphasis on tooling and workflows. Apollo Client is a sophisticated GraphQL client that manages data and state in an application. Among other benefits, it enables a declarative programming style that lets developers define queries as part of UI components; the client manages all the hairy details of binding query results to the UI, managing consistency, caching, and so on. Apollo Client also supports an exceptionally elegant approach to state management by extending the GraphQL schema inside the client with additional structure. Apollo Client includes integrations for React, React Native, Vue, Angular, and other view layers. iOS and Android clients, originally contributed by the community, make it possible to query a GraphQL API from native iOS and Android applications. Apollo CLI — a simple command line client that provides access to Apollo cloud services. Schema registry — a registry for GraphQL schemas that acts as a central source of truth for a schema, enriched with additional metadata like field-level usage statistics. Client registry — a registry to track each known consumer of a schema, which can include both pre-registered and ad-hoc clients. Operation registry — a registry of all the known operations against the schema, which similarly can include both pre-registered and ad-hoc operations. Trace warehouse — a data pipeline and storage layer that captures structured information about each GraphQL operation processed by an Apollo Server (or any other server that implements the Apollo trace API), including the specific set of fields accessed, the tree of resolver calls that were made with timing data for each, and important metadata such as client's identity and which version of the schema was queried. Apollo Gateway — A configuration of Apollo Server and additional plugins that functions as a GraphQL gateway. The gateway composes separately deployed "micro-schemas" that reference each other into a single master schema, which looks to a client just like any regular GraphQL schema. To answer queries, the gateway builds a query plan, fetches data from each upstream GraphQL service, and assembles it all back together into a single result. Apollo includes a facility for checking the compatibility of a given schema against a set of previously-observed operations. This uses the trace warehouse, operation registry, and (typically) the client registry. As an example, an operation that references a missing field or an operation that doesn't pass a required argument to a field would cause an incompatibility error. The compatibility check runs statically, taking advantage of the schema's type definitions, so it doesn't require a running server. Apollo provides an end-to-end mechanism for safelisting known clients and queries, a recommended best practice that limits production use of a GraphQL API to specific pre-arranged operations. There are two parts here. First, the Apollo CLI extracts all the queries from a client codebase, computes the over-the-wire subset of the query (stripping out the part that references the client's local schema), and stores it in the operation registry. Separately, an Apollo Server plugin synchronizes the list of pre-registered operations to the server, which then rejects queries that aren't present in its local copy.